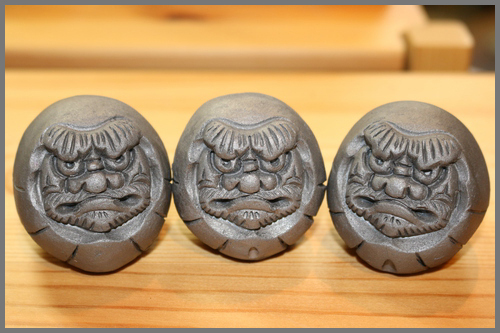 We have two Daruma tiles on the roof of our Daruma Hall, one on each side. They were especially made for us from a mold. 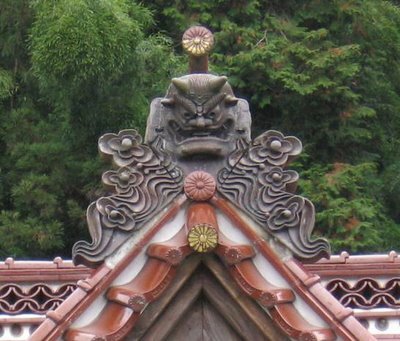 The genelic name for decorative roof tyiles found at the ends of a main ridge *oomune 大棟, or descending ridge *kudarimune 降棟. 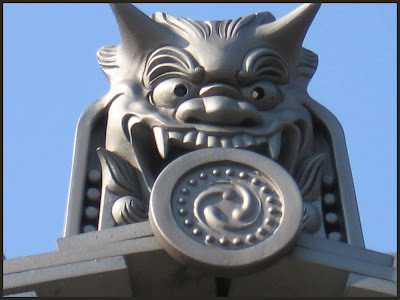 In the Nara and Heian periods they were usually decorated with flower or animal designs, and in theKamakura period with a goblin (oni 鬼) mask. Usually tile but occasionally made of stone or wood. 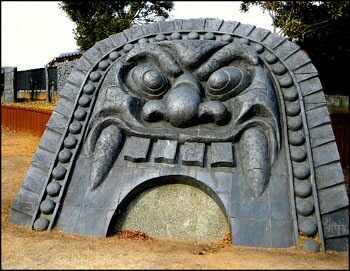 Swirling or wave patterns found at the bottom right and left of the onigawara are called *hire 鰭. 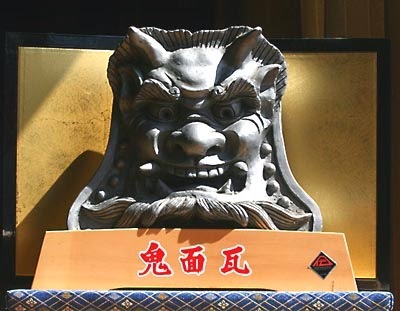 In the case of temples, shrines and palaces the terms *oni-ita 鬼板 or *hanagawara 花瓦 are sometimes rsed insted of onigawara.
. Mimasaka, Doi Juku 出雲街道　美作市土居宿 . kawara　瓦 roofing tiles / Lit. tile. The roofing material made of fired clay introduced to Japan from Korea (Paekche Kingdom, Jp: Kudara 百済) during the 6c along with Buddhism. During the 570s at the time of the reign of Emperor Bidatsu 敏達 (reign, 572-85), the king of Paekche sent six people to Japan skilled in various aspects of Buddhism, including a temple architect. According to the NIHONSHOKI 日本書紀 (Chronicles of Japan) a temple was founded by Prince Ohowake of Naniwa. 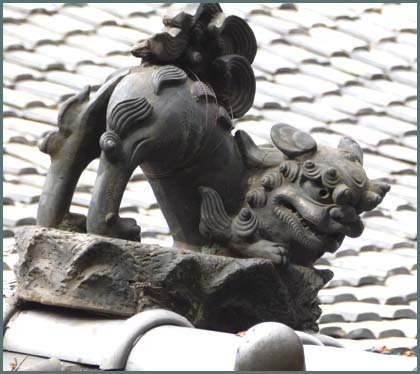 In 588 more tilemakers and architects were among the specialists sent to Japan. In that year the temple of Houkouji 法興寺 (Asukadera 飛鳥寺), Nara, was begun. Many of the oldest roof tiles in Japan have been excavated from this site. 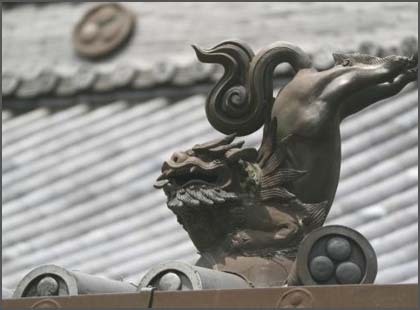 Tiled roofs were used for temple and government buildings but for the emperors' palaces and dwellings of the nobility, traditional materials such as miscanthus reeds *kayabuki 茅葺 were preferred. In regard to the content of the clay, an interesting statement is found in the ENGISHIKI 延喜式 Takumiryou 木工寮 Sakuga (Tile Making and Woodworking Styles in the Engi period; a 10c Japanese document) which states that after the middle of the 8c, it was common practice to mix 24 kilograms of clay with 10 litres of sand. This mixture, it goes on to say, is easier to shape and allows less shrinkage when fired than the higher quality clay used previously. There are two known techniques for manufacturing clay roof tiles. 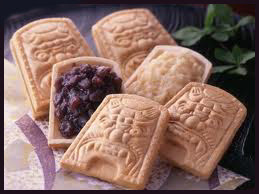 One is the Cylindrical Mold Method, which until recently was used in Okinawa and Korea. The other one is the Curved Mold Method has been used in Japan (except Okinawa) since the middle of the 7c. With the former method, well kneaded clay is firmly packed into a trapezoidal pile. Sticks are set on each side at a fixed distance from the top, and with a tool like a large cheese cutter, a slice is removed from the surface. This is repeated again and again depending upon the desired number of tiles. A wooden cylinder is placed on a turning plate, a tool like a slow potter's wheel, and the cylinder is then covered with cloth made of banana fiber (in Okinawa) or hemp or ramie (in Korea). At the top and bottom of the cloth is a string used for removing the finished tile from the form and then for removing the cloth from the clay. As can be seen the slice of clay has been pressed around the cylinder and smoothed and shaped as the plate revolved. When the tile is finished and removed from the cylinder, it is allowed to dry for a day or two. Especially notice are two sticks protruding from the top of the wooden cylinder. These may number two or four depending upon how many pieces the tile will be divided into. Where the stick is inserted, the clay is thin, and after it has dried out it can be tapped lightly to sever it into the required number of pieces. If the cylinder is divided into two, it will form round roof tiles; if it is separated into four parts, these will become flat roof tiles. It shows clay on cylinders. Notice that one clay circular form is inverted and another placed on top to dry. 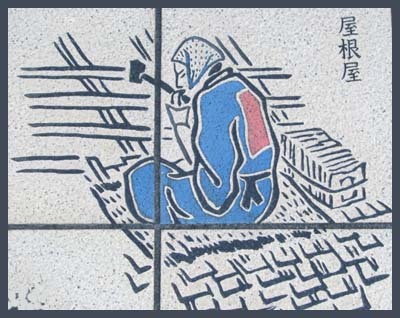 The second method, the Curved Mold Technique, used in Japan proper, depends upon individual molds already in the shape of the desired tile. It shows a mold for a circular tile. Most roof tiles were fired once and used immediately afterward. However, some glazed tiles have been found at palace sites, for example, at the 8c Japanese capital of Heijoukyou 平城京 in Nara and the 9c to 12c site of Heiankyou 平安京 in Kyoto. Not enough glazed tile has been recovered to be convinced that entire roofs were made of this. Mainly ornamental plates have been recovered, which would seem to indicate that perhaps the glazed tiles were placed only at the edges. Some of the earliest tiles studied seem to show traces of red ochre, black and some white, which appears to be some sort of lime or chalk, rather than paint. The roof maker works with a helper called temoto　手元. The place below the roof tiles is first covered with mud/clay, then the tiles are fixed with nails. The overseer has to make sure the roof gets the right shape. yane　屋根 - Also called okugai 屋蓋, lit. roof covering. A generic term for various types of roofs, roof styles, and roofing. See *yane kouzou 屋根構造 for roof structure. The major types of roofs are gable *kirizuma-zukuri 切妻造, hipped yosemune-zukuri 寄棟造, hip-and-gable *irimoya-zukuri 入母屋造, and pyramidal roofs *hougyou-zukuri 宝形造, including hatchuu 八注, a roof over an 8-sided building *hakkakudou 八角堂, and rokuchuu 六注, a roof over a six-sided structure *rokkaku endou 六角円堂. 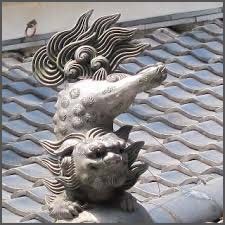 2 teriyane 照り屋根, also called soriyane 反屋根, a roof that descends from the ridge to the eave ends with either gentle or strong. Kairyuuouji Saikondou 海竜王寺西金堂 in Nara, Ankokuji Kyouzou 安国寺経蔵 in Gifu prefecture. 4 terimukuri yane 照り起り屋根, a roof with a convex curve in the upper part of the roof, as for example, the roof of the *karahafu 唐破風, gable at the front of the Tsukubusuma Shrine's main sanctuary, Tsukubusuma Jinja Honden 都久夫須麻神社本殿 (1602) in Shiga prefecture. *Shikorobuki 錣葺 is a very rare type of roof type. Its contours resemble a the hip-and-gable type roof, but the gable and hips are separate, without a continuous flow from the ridge to the eaves. 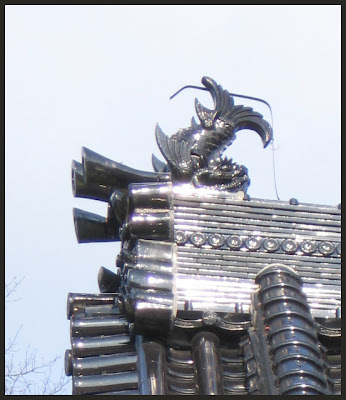 Instead, the part that extends from the ridge to the base of the gable ends and the hips are connected beneath the gable ends and continue to the eave ends. Thus there is a very clear break between the two parts of the roof. Examples include the Tamamushi miniature shrine *Tamamushi no zushi 玉虫厨子 (mid-7c) owned by Houryuuji 法隆寺, and Toudaiji Nenbutsudou 東大寺念仏堂 (1238), both in Nara. The Byoudouin *Hououdou 平等院鳳凰堂 Byodo-In (1053) in Kyoto, exemplifies the combination of roof types with a variety of contours. By the 15c and 16c., new combinations of roofs had evolved. Building roofs from this era combined many parts and had many ridges such as *gongen-zukuri 権現造, exemplified by Oosaki Hachiman Shaden 大崎八幡社殿 (1607) in Miyagi prefecture. Roofs of this type use tiles *kawara 瓦, cypress bark *hiwadabuki 桧皮葺, shingles *kokerabuki 柿葺, various types grass, kusabuki 草葺, including cogon grass *kayabuki 茅葺, straw of wheat or rice warabuki 藁葺.
. yuki kanashi itsu Daibutsu no kawarabuki .
. Dragon Roof Tiles and gatoo 瓦当 end tiles .
. Tile Dolls 瓦人形 kawara ningyoo . Thank you so much, Sakuo san ! Written in 1686 - 貞亨3年. According to Kikaku, Basho wrote this when he was ill in Bed in Fukagawa. 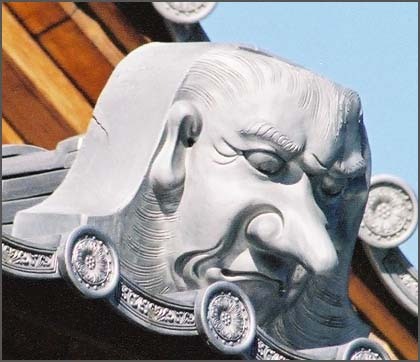 It seems he could see the roof of Asakusa Kannon temple from his home, which is about 3.5 km away. news broadsheet, lit. "tile-block printing"
yomiuri 読売、lit. 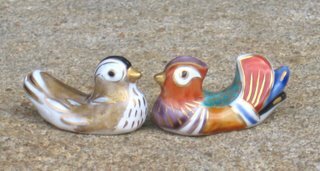 "to read and sell"
Also called toriyasumi 鳥休: bird rest or suzumegawara 雀瓦. 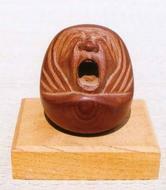 A cylindrical bird perch tile which has a strong upward curve and is placed on top of an ogre tile *onigawara 鬼瓦. They are placed at the ends of a main ridge *oomune 大棟, on corner ridges sumimune 隅棟 or on descending ridges *kudarimune 降棟. One is also placed on *chigomune 稚児棟, offspring ridge, the shorter and outer-end ridge when the corner ridge is divided in two by a long corner ridge *sumikudarimune 隅降棟. Toribusuma have a decorative pendant tile *gatou 瓦当 at the front end. The upper surface has minimal to exaggerated curves. The under side that reaches from the pendant tile inward is called a chin, ago 顎. Toribusuma were short in the early periods, but from the 15c the length and upward curvature increased radically. said to be the only one in Japan. at temple 妙心寺 Myoshin-Ji, Kyoto. To protect the whole town from evil influence. 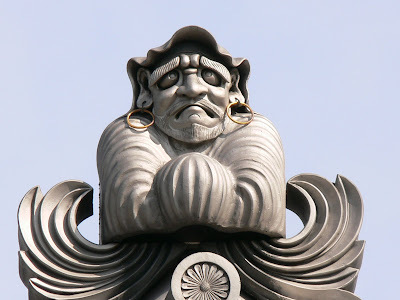 kahaku, kawa no kami 河伯 River Deity, "river chief"
originally a Chinese river deity with a demon-like face. 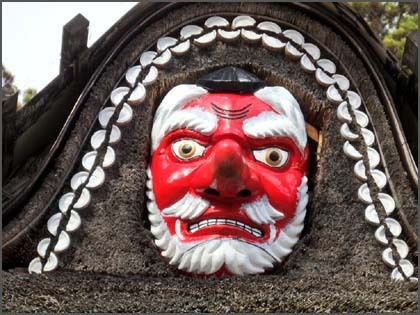 Sometimes his face is part of a "demon tile" onigawara 鬼瓦　to protect a building from fire. 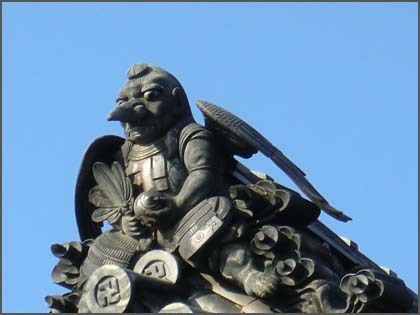 A small shrine on the roof, mostly of a merchant, to protect the estage and the shop. 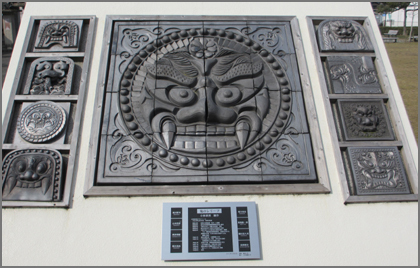 At 天徳寺 temple Tentoku-Ji in 愛宕下 Atago-shita there is a demon roof tile with a tokin 兜巾（ときん）Buddhist hood.